Sometimes it is necessary to impose certain order on the tasks in a threadpool. Issue 206 of the JavaSpecialists newsletter presents one such case: we have multiple connections from which we read using NIO. We need to ensure that events from a given connection are executed in-order but events between different connections can be freely mixed. 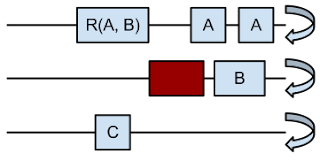 Using this interface the threadpool decides if two tasks may be run in parallel or not (A and B can be run in parallel if A.isCompatible(B) && B.isComaptible(A)). These methods should be implemented in a fast, non locking and time-invariant manner. If the task to be added doesn’t conflict with any existing tasks, add it to the thread with the fewest elements. If it conflicts with multiple threads, add tasks (shown with red below) on all but the first one of them on which a task on the first thread will wait, after which it will execute the original task. Compared to the solution in the JavaSpecialists newsletter, this is more similar to a fixed thread pool executor, while the solution from the newsletter is similar to a cached thread pool executor. If immediately after a “rollup” is submitted (and before it can be executed) tasks of the same kind are submitted, they will unnecessarily be forced on one thread. We could add code rearrange tasks after the rollup task finished if this becomes an issue. Have fun with the source code! (maybe some day I’ll find the time to remove all the rough edges). ** – benchmarking indicated this to be the most performant solution. This was inspired from the implementation of the ThreadPoolExecutor.